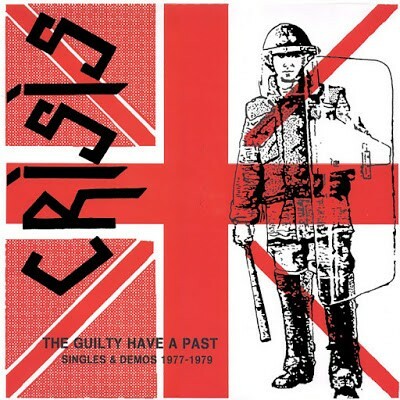 This unofficial compilation by State Laughter Records is full with fourteen nuggets and we talkin’ about Crisis, a band which was formed 1977 in Guildford, a large town in Surrey, with the lineup of Phrazer (vocals), Lester Jones (lead guitar), Douglas Pearce (guitar), Tony Wakeford (bass) and Insect Robin (drums) and they released in their short lifetime three great singles and a mini-LP. “Crisis adopted slower tempos and concentrated more on the atmosphere and tension of the music rather than just making a loud, generic thrash.In many ways, by 1978 they were already dabbling in a style which, much later on, would be referred to as Post-Punk, not a million miles away from early Joy Division or The Ruts’ moodier moments.” In early 1979, the band underwent a major change in personnel when Phrazer and Insect Robin were replaced by Dexter (a longtime fan and roadie) and Luke Rendle. After performing their last show, supporting Magazine and Bauhaus in their hometown of Guildford @ Surrey University 10.05.1980, the band broke up.